ANSWER: Ionized water is produced from a specific water filter system that also ionizes the water using electrolysis (a technology that uses electricity and electrode plates). So the water ionizer sits on the counter top and attaches either to the faucet OR it is installed under the sink. You turn the tap water on and the water runs through a filter to remove contaminants and then it is electrolyzed, using the naturally occurring minerals in the water. The water that is produced by a high-quality water ionizer, such as the AlkaViva ionizers, has unique properties. Superior hydration. The main reason ionized water is more hydrating is because the ionization process reduces the size of water molecule clusters and restructures the water. Water that is micro-clustered and restructured is more readily absorbed by the tissues and cells of the body. Alkalinity. The drinking waters produced by these water ionizers have a pH range of 8.5 pH to 9.5 pH. Most drinking waters, especially bottled waters are acidic, with a pH below 7.0. Ionized water contains an abundance of ionic minerals, which are essential for optimal health. The alkalinity of the water will also help to neutralize acidic waste in the body which is an underlying factor in many diseases in the body. Antioxidation. Last but not least is the antioxidant potency of ionized water. During the electrolysis process, the water gains an excess of electrons, which gives it the negative ORP values. This is similar to what happens when water melts from glaciers or mountain tops and flows down stream. The water is activated and ionized. If you stand near a waterfall, you will certainly experience the rejuvenating effects of ionization from the mist and air you breathe. 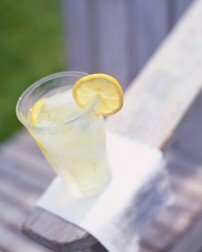 Best water for a lemon drink. So, going back to your question about what is the best water to use for a lemon drink, I believe that water that is filtered of contaminants but still contains minerals will provide the maximum health-promoting benefits of fresh lemons. Since reverse osmosis and distilled water are de-mineralized, I do not recommend using those waters long term for your daily lemon drink. I believe squeezing fresh lemon juice in ionized water does provide quicker and better absorption of the nutrients in lemons because of the micro-clustering effect of the ionized water molecules. Both the lemons and the ionic minerals in the ionized water will help to alkalize the body in a natural way.